During a conversation with Julia Child, Donna Aliperti was discussing her childhood in the restaurant business and acknowledged that she was a self taught chef. Julia replied, "Donna, you must say you learn day by day." Since that persuasive proverb was proclaimed, every day has become a learning experience for Donna. At age Eight, Donna's parents purchased a small restaurant in New Jersey. By the time she was 15, she had begun working the cold station. By the age 22 she was working the line with her father. She inherited the 140 seat restaurant with an eighty seat banquet facility at age 26. Two years later	she was ready for her next adventure. 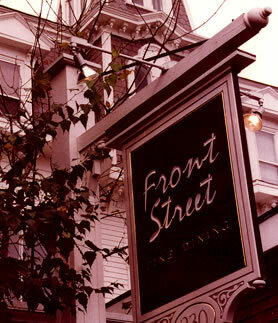 After spending two summers in Provincetown, she purchased Front Street. When Kathy Cotter came to work for Donna, she became an intergral part of the kitchen operation as both sous chef and pastry chef. Via cooking schools in Italy, travel to southern France and constantly reinventing their dishes they continue to learn and create day to day.